Wer gerne den dafür erforderlichen Aufwand treiben möchte, ist herzlich dazu eingeladen, die knapp 80 Seiten umfassende Beschreibung ins Deutsche zu übersetzen :-)). 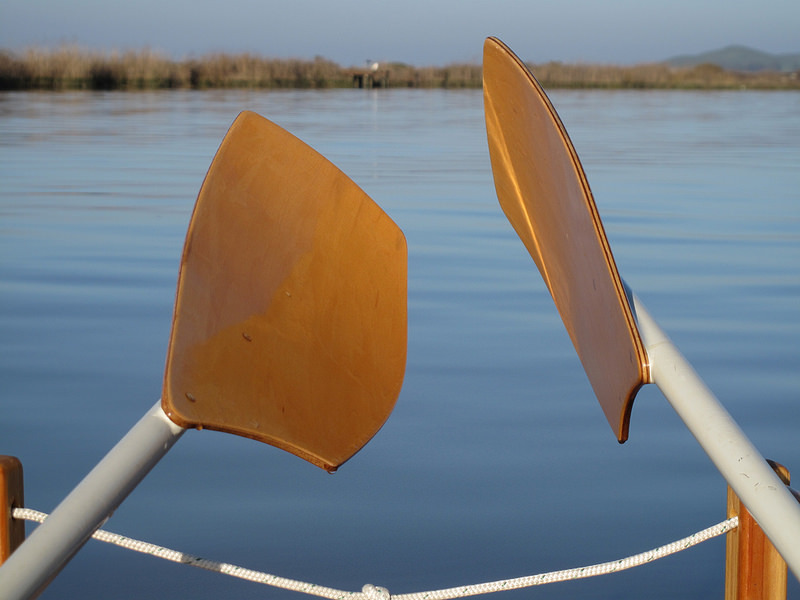 Rick Thompson from the USA created these lightweight laminated spoon blade oars. They are 2.9 meters long. The weight is 1.62 kgs each. With his kind allowance I offer here for free a description of the development and the making of these oars, an 1:1 drawing of the blade templates, and a drawing of the loom as well. 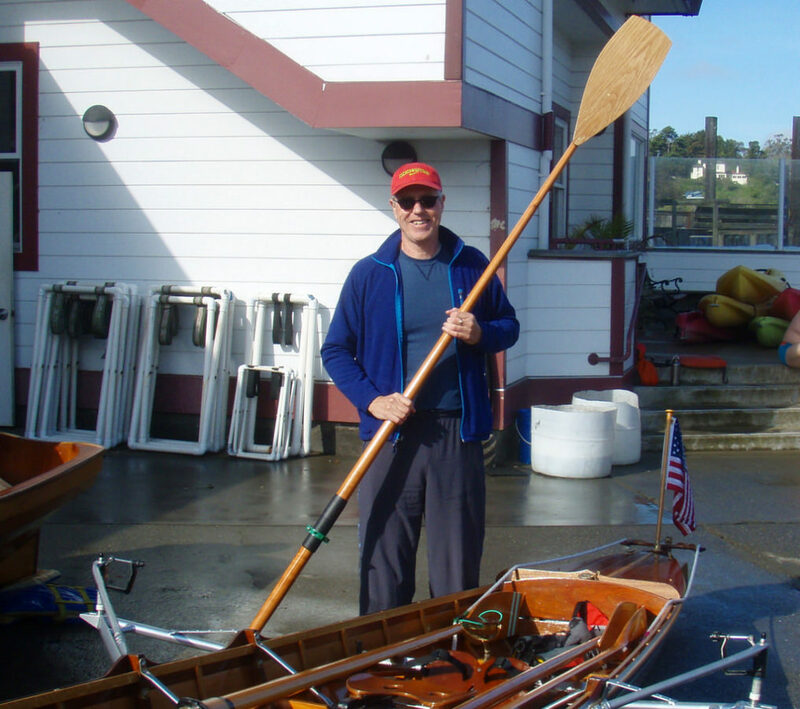 Rick is using ergonomic mountain bike handlebar handles for his oars (see instruction document). 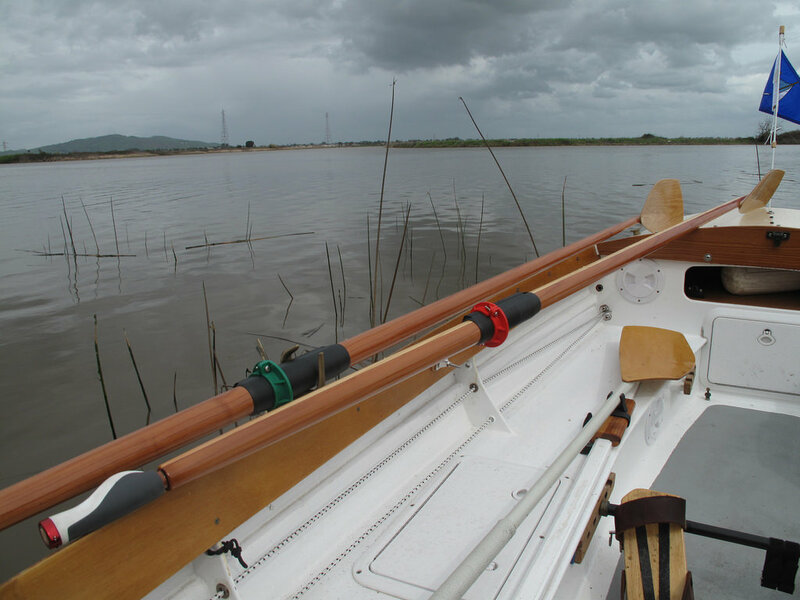 With this he’s able to use a round loom sheated with a rope together with oval bronze oarlocks instead of the usually used plastic oarlocks for D-shape looms. This is useful for a way less noisy row ( no click-clack when feathering/squaring the blades at all). The drawing can be printed on two A3 Portrait sheets. The blue lines of the grid have a distance of 50 mm. They are thought to help you to put the two sheets precisely together. The red lines can be used to build your bending form. The drawing can be printed on two A3 Portrait sheets. The blue lines of the grid have a distance of 50 mm. They are thought to help you to put the two sheets precisely together. Sorry, but there is no bending drawing available for these blades. The drawing can be printed on two A3 Portrait sheets. The blue lines of the grid have a distance of 50 mm. They are thought to help you to put the two sheets precisely together. The loom shown here including the grip (length 150 mm) has a total length of 2’700 mm. This results in an oar with a total length (grip, loom and blade) of 2’900 mm. For lightness it is made from spruce. The back/bottom side of the loom (the side pressed against the oarlock during the power stroke, and lying on the back side of the blade) is reinforced with a strip of hardwood (e.g ash or oak, height 8-10 mm). This side remains its height over the full lenght of the loom. The grip is an integral part of the loom. It has a length of 150 mm and a diameter of 32 mm. The loom diameter at the grip shoulder is 38 mm. The oarlock area of the loom (between 620 and 1’070 mm from the grip end) has a diameter made to mount a D-shape oarlock sleeve. This diameter depends on the oarlock sleeve you want to use (it can be more or less than the 45.5 mm as shown in the drawing). Check your sleeve and adjust your diameter accordingly! 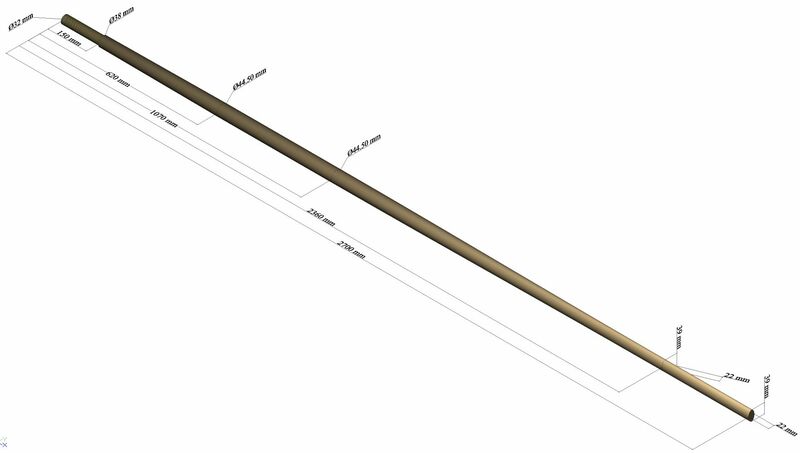 The blade end of the loom (between 2’260 and 2’700 mm from the grip end) is an edge rounded rectangle of 22 x 39 mm. The height of the loom depends on your decision wheter you want to have the blade’s begin edge, and/or the blade’s back side ending flush with the loom or not. With a height of 39 mm the blade’s begin is flush with the loom, and on the back side of the blade the loom’s end has a height of about 4 mm. The loom’s end will be cut out according to the lower side of the blade to glue the blade on it. Falls Sie die Schablonen für die Bauteile nicht selbst anhand der Offset-Tabellen von Thomas Yost zeichnen wollen oder können, dann kann ich das für Sie tun. Und falls Sie das haben wollen, kann ich auch Zeichnungen für Sie anfertigen, mit denen Sie diese Teile CNC schneiden können. Falls Sie die Schablonen für die Bauteile nicht selbst anhand der unten angegeben Offset-Tabellen zeichnen wollen oder können, dann kann ich das für Sie tun. Und falls Sie das haben wollen, kann ich auch Zeichnungen für Sie anfertigen, mit denen Sie diese Teile CNC schneiden können.